Since 2001 the Patriots have played in eight Super Bowl championships and won five, a run of excellence unparalleled in all of professional sports. In a league designed to ensure that no one franchise can dominate over time, New England won for over a decade and a half. A dynasty that began with an improbable run to a championship in 2001 has rebuilt, rebooted, and retooled several times over, winning most recently in 2017. But during those years, no other franchise reached the same level of controversy, drama, and turmoil—or even came close. 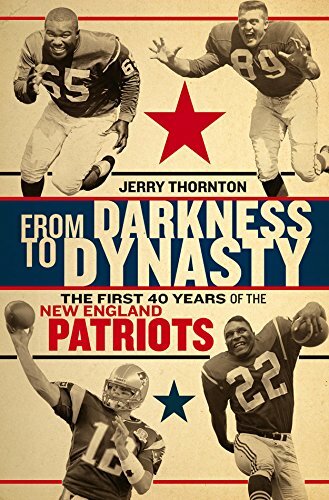 Jerry Thornton, bestselling author of From Darkness to Dynasty, provides an all-access pass to the Patriots’ years of unparalleled greatness from the unique perspective of an observant, obsessive, utterly dedicated fan. Love them or hate them, what New England has been able to do over the past 15 years is nothing short of remarkable. Now, not only boasting four Super Bowl Championships, the Patriots also have the best coach in the league, a smart and savvy front office, and a future Hall of Fame quarterback who is internationally recognized as the face of the NFL. And as the Patriots continue to dominate, on the field as well as in the media and the American pop culture landscape, the harder it is for anyone to remember them as anything other than a model franchise and the ultimate paradigm of success and accomplishment. Anyone, that is, except for Jerry Thornton. It wasn’t always sunshine and roses for the Patriots; in fact, for the bulk of their existence, it was exactly the opposite. Though difficult to fathom now, the New England Patriots of old were not just bad—they were laughably bad. Not too long ago, the Pats were not only the laughingstock of the NFL, but of the entire sporting world. From Darkness to Dynasty reveals the unlikely history of the New England Patriots as it has never been told before. From their humble beginnings as a team bought with rainy day money by a man who had no idea what he was doing to that fateful 2001 season that saw them win their first Super Bowl, Jerry Thornton shares the wild, humiliating, unbelievable, and wonderful stories that comprised the first 40 years of what would ultimately become the most dominant franchise in NFL history. Witty, hilarious, and brutally honest, From Darkness to Dynasty returns to the thrilling, perilous days of yesteryear—a welcome corrective for those who hate the Patriots, and a useful reminder, for those who love them, that all glory is fleeting. Jerry Thornton writes daily for Barstool Sports and co-hosts their NFL podcast Laces Out. He's a stand up comic working clubs all over the northeast and is author of Darkness to Dynasty: The First 40 Years of the New England Patriots. Jerry is the former co-host of WEEI sports radio's "Dale and Holley with Thornton," and NBC Sports Boston's Patriots pregame show. He appears in HBO's Emmy-winning Red Sox documentary "Reverse of the Curse of the Bambino" as well as the upcoming Deflategate film "Four Games in Fall." And you can catch in him the popular web video series "Sh*t Pats Fans Say." Jerry has written a million columns and he's rocked them all.